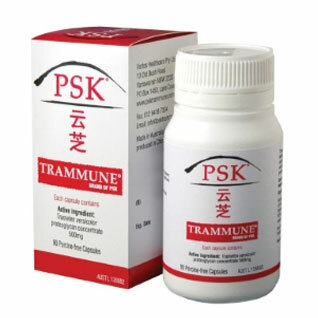 PSK Trammune® is sold in bottles of 90 capsules and contains PURE CONCENTRATED PSK EXTRACT. Medicinal Mushrooms have been widely used for centuries throughout Asia. The most well known of these is Coriolus versicolor also known as Trametes versicolor, Yun Zhi , Kawatake or Turkey Tail. It can be identified by a fan-shape of colourful waves which is why it is often referred to as the Turkey Tail Mushroom. PSK Trammune® contains an extract derived from this medicinal mushroom. The extract from this mushroom has been used for many years in Traditional Chinese Medicine. PSK is the agent extracted from the Trametes versicolor medicinal mushroom using a multistep hot water extraction process. A sophisticated analytical “fingerprint” method of testing is used to ensure that every batch of Trammune® offers quality, purity, potency and consistency. Ask your Healthcare Professional about PSK. If you would like information to take to your Health Professional just send us a message here. We will soon be introducing a dedicated Health Professional website which will provide more detailed information on PSK, research papers, information sheets and more. To register your interest please contact us. Defend Health Naturally is 100% Australian owned. We produce a product called PSK Trammune® and a second product which is being prepared with a new improved formula called ImmunoStim®.